There is a vast array of my favourite condiments that are used to create delicious meals and they need some explanation. There are many new ones that need some explanation. So if you have some information on one that you would like to share, here is the place to do it. I will continually update this list till I have them all in here. Please feel free to tell us which ones you love to use. One of my all-time favourite condiments is Spike Seasoning which is a tasty seasoning always in my kitchen. It is a special blend of 38 herbs, vegetables, and exotic spices, combined with some salt. It is gluten-free but not soy free. Ingredients: salt and sea salt crystals, hydrolyzed vegetable protein, yeast, toasted onion, onion powder, soy flour, orange powder, celery root powder, celery leaf powder, garlic powder, kelp, dill, Indian curry, white pepper, horseradish, lemon and orange peel, savory, mustard flour, red and green bell peppers, parsley, tarragon, safflower, rose hips, mushroom powder, spinach powder, paprika, tomato powder, sweet cayenne pepper, oregano, marjoram, sweet basil, rosemary and thyme. It is properly known as Bragg Liquid Aminos is a Certified NON-GMO liquid protein concentrate, derived from healthy soybeans. Ingredients: Bragg Liquid Aminos are made from health-giving, NON-GMO soybeans and purified water. They are an excellent, healthy, gourmet replacement for Tamari and Soy Sauce. Not fermented or heated and Gluten-Free. Bragg’s has a small amount of naturally occurring sodium. No table salt is added. If less sodium is desired, use a 6 oz. Bragg’s spray bottle and dilute with 1/3 distilled water or to taste and then either add in or spray on food. reserved for special occasions. Eventually, producers learned to brew tamari as a liquid soy sauce that had similar characteristics as the original by-product of miso. This tamari is organic and brewed from whole soybeans, sea salt, water, and koji (Aspergillus hacho). It is gluten-free and popular with those who have wheat allergies. By contrast, commercial soy sauces (even some labeled as shoyu or tamari) are usually made from soybeans that have been defatted with hexane, a petroleum derivative. Common shortcuts are artificial fermentation methods including genetically engineered enzymes. In fact, most soy sauce is actually caramel colored water with lots of salt, hydrochloric acid treated soy isolate, and sugar added. Carefully choose your soy sauce as you would an olive oil or a fine wine. Look for the words traditionally brewed and natural or organic, and make sure the manufacturer backs this up. This is an old favourite condiment in my kitchen. I like to use Raw Organic Sesame Seeds and buy lots at the same time at a good price. Also, so I can make double the recipe above and have lots for other meals. These flakes add a tangy, cheesy taste to my food which is good since I don’t eat cheese. I add this to sauces and pesto as a replacement for Parmesan cheese. 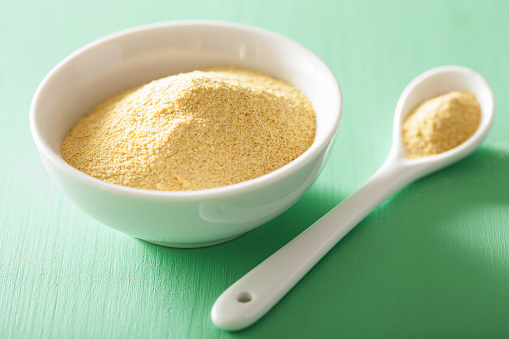 Nutritional yeast flakes are an inactive form of yeast and are a good source of protein (contain 18 amino acids and nine are essential ones which your body cannot produce). Also, are a great source of B vitamins and the minerals iron, seleniu, and zinc. Not to be confused with baker’s yeast, which is still active and can grow inside your stomach, depriving you of nutrients, or with brewer’s yeast, which is inactive but bitter. This is a rock salt that helps to re-mineralize your body with minerals and trace elements (Calcium, Magnesium, Potassium, Copper and Iron) which are essential to our health. It is harvested in the Himalayan Mountains; it was formed in the last 250 million years. It is a very purest salt and is free of pollutants and toxins. Salt is a necessary part of cooking as long as we do not use too much and use the right kind. 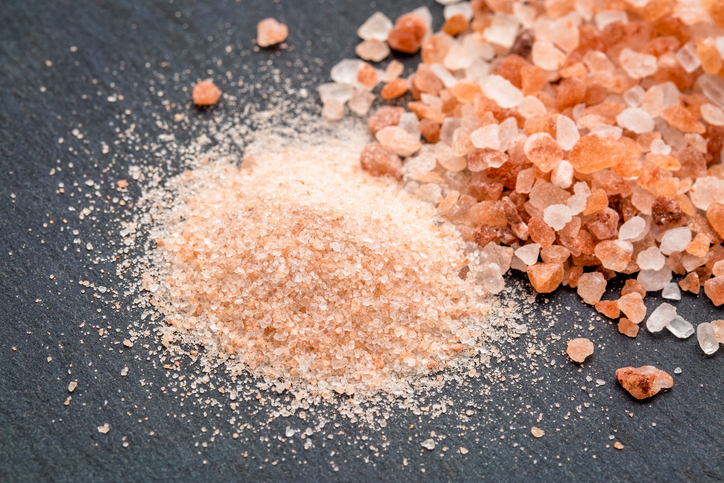 I use Himalayan salt as it is rich in nutrients and minerals. Also, it is the kindest salt for the body. One of my favourite condiments is seaweed flakes which I use instead of salt. Dulse is a red color and has a delicious fresh crisp flavor. Get the dried granules to sprinkle on food either during cooking or at the table. 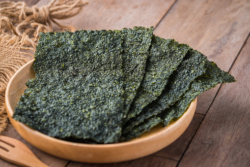 Nori is thin and its oily iridescence reflects the colors of the rainbow.Get it as dried granules that can be sprinkled on food either during cooking or at the table. Bull Kelp is one of the tastiest seaweeds; it is not like any other kelp I have had. It is fine and tender. Great sprinkled on foods. I also recently bought Liquid Aminos made from Coconut Sap at a Health Food store. It says Organic, Gluten Free, Dairy free and non- GMO. I presume this would also be a good alternative to commercial soy sauce and does not have soy in it either. It tastes pretty good, like soy sauce, but less salty. That sounds good. It says Coconut Aminos, made from this natural sap and blended with sun dried, mineral-rich sea salt. Have to say I have not seen it or tried it yet. I will now be looking into getting some. Thank you.